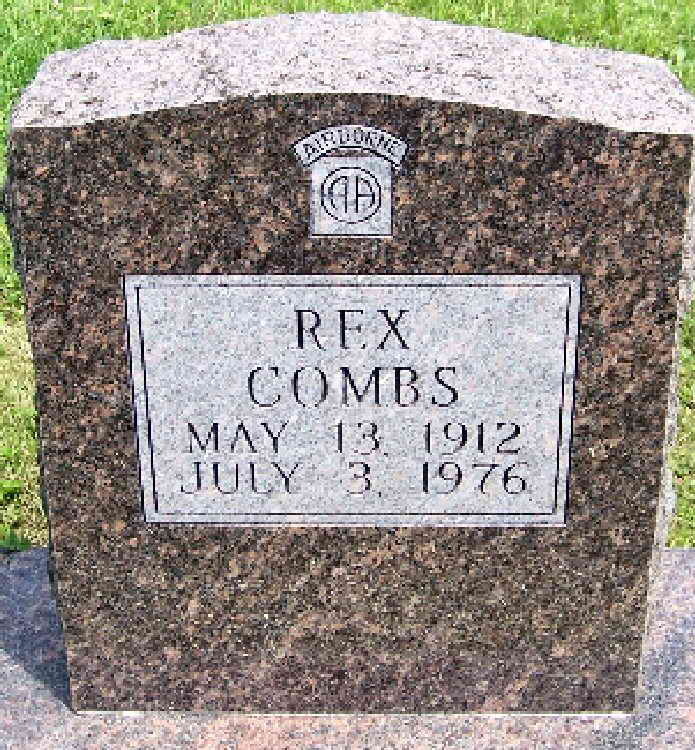 Rex G. Combs is buried in the Kirk Cemetery, Allendale (Worth County), Missouri along with two sons. Rex, a Captain in Co A during WW-II, died in Chicago of a heart attack during the 508th's 2nd Annual Reunion. 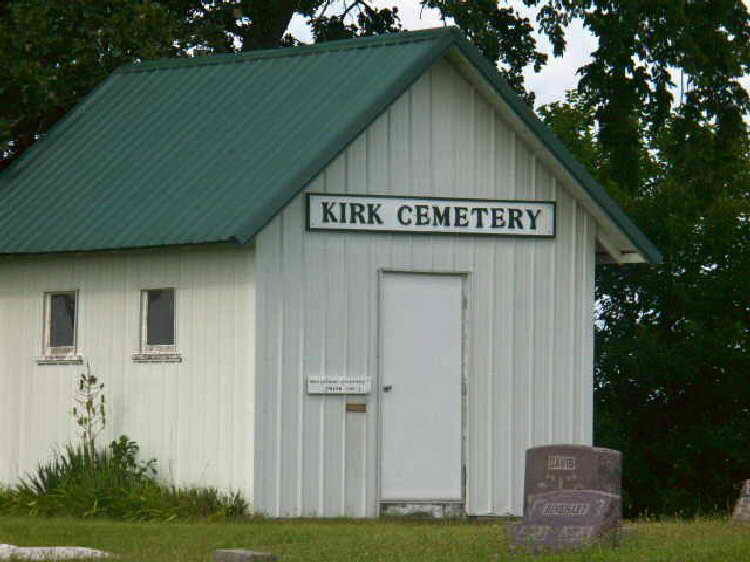 As early as his death was, he survived two sons. 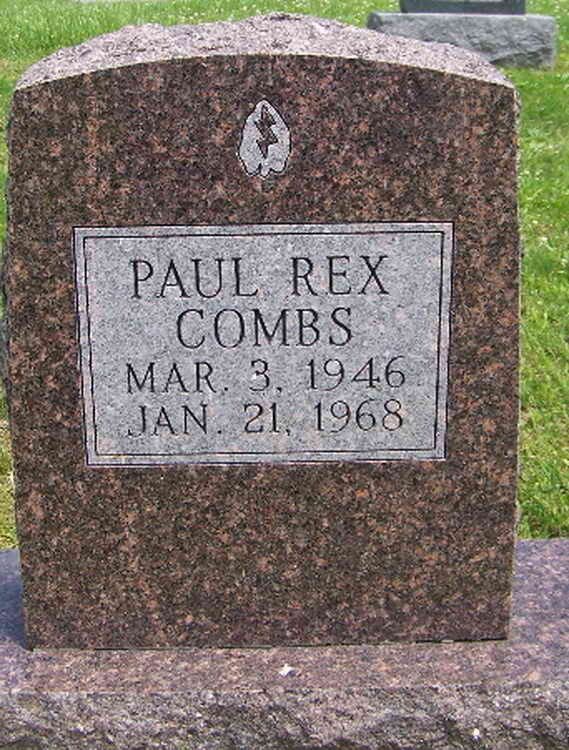 Rex, Jr. died as an infant in 1934 while Paul Rex was killed in action in Vietnam in 1968. The simplicity of the stone with just the 82nd Airborne Division insignia engraved on it belies his many decorations which include: the Silver Star with one Oak Leaf Cluster (OLC), the Purple Heart with three OLC, Distinguished Unit Citation, the French and The Belgian Fourragere, the Netherlands Military Order of William, Combat Infantryman Badge and the Europe-Africa-Middle East Campaign Medal with Bronze Service Arrowhead for participation in Operation Neptune, Normandy, D-Day, 6 June, 1944 and four Campaign Stars denoting participation in Normandy, Holland, Belgium and Central Europe. In addition, he was knighted by Queen Wilhelmina of The Netherlands with the award of the The Dutch Bronze Lion, by: "distinguishing himself during the operations of the 82nd Airborne Division in the area of NIJMEGEN in the period from September 17 to October 4, 1944, by doing particularly gallant and tactful deeds and setting, in every respect, a praise worthy example in very difficult circumstances." Paul was a member of the 25th Infantry Division. He was killed by small arms fire in action in Tay Ninh, Vietnam. His name appears on Panel 35E - Line 4 of the Vietnam Memorial Wall in Washington, DC.